A concise anthology including a wide range of music from the twentieth and twenty-first centuries. Nineteenth-century music in its cultural, social, and intellectual contexts. This book began as an attempt to carry out a suggestion made in 1929 by Carl Engel in his "Views and Reviews"-to fulfill his wish for " a living record of musical personalities, events, conditions, tastes ...a history of music faithfully and entirely carved from contemporary accounts. The music of the twentieth and twenty-first centuries in its cultural, social, and intellectual contexts. Joseph Auner's Music in the Twentieth and Twenty-First Centuries explores the sense of possibility unleashed by the era's destabilizing military conflicts, social upheavals, and technological advances. Auner shows how the multiplicity of musical styles has called into question traditional assumptions about compositional practice, the boundaries of music and noise, and the relationship among composer, performer, and listener. He also shows how composers and their works have played important roles in defining ideas of nation, race, and gender, and thus in shaping the modern world for better and worse. 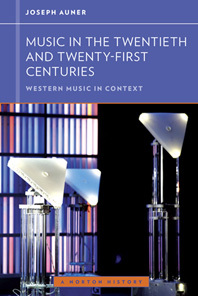 Like the other volumes in the series, Music in the Twentieth and Twenty-First Centuries brings a fresh perspective to the study of music by emphasizing social, cultural, intellectual, and political contexts of the music. Joseph Auner looks far beyond the notes on the page or the details of composers’ lives to embrace audiences, performers, institutions, and social settings. For example, the text shows how the "tangled chaos" of unlimited possibilities available since the early twentieth century has energized composers to re-imagine what music might be. Along with the other volumes in the series, Music in the Twentieth and Twenty-First Centuries is designed for maximum flexibility in the classroom. The text may be packaged with the accompanying 26-work anthology, with Strunk’s Source Readings in Music History, or with Norton Critical Scores, all at a significant discount. The text is also available as a low-priced ebook.